Think of this as the perfect party dish. It works for any time of day, so even if you're going to a breakfast party (actually especially if you're going to a breakfast party), you can make it. It's light, bite-sized, and has good-for-you protein that'll keep guests from having carb comas and going into sugar overload from all the other party treats they'll be munching on. And the best part is that it's completely transportable and can be served at room temperature. The dish I'm talking about is quiche -- made mini. This recipe is actually adapted from a recipe my aunt gave me for the quiche she makes every Christmas Eve. I was so excited when she gave me the recipe because I no longer have to wait to have it just once a year. And I love that quiche is so versatile that I've been able to make it my own. One of the best features of this quiche is its crust. It's not some heavy, buttery, flaky, cranky, touchy crust. It doesn't require a food processor or Kitchen Aid. It doesn't require any rolling, trimming, or even any weighting during baking or any pre-baking. It's a simple crust you can mix together by hand and press right into tart pans. It stays soft after the quiche is baked and has no hard or dried out edges. I think it's the perfect texture to complement the custardy egg filling. I should tell you that I don't really love pie crust, and that might be a big contributing reason as to why I like this crust so much. It's crust that acts as a sideshow to the main event. It's subtle. It doesn't try to takeover. That's the way it should be. The main event is a mixture of egg, heavy cream, and Gruyere, and the filling can be whatever you want it to be. I knew I wanted to please the vegetarians with one quiche and the carnivores (or omnivores) with the other, so I made spinach quiche and bacon and onion quiche. While you can make the quiche in a normal-sized tart pan, I opted to use my mini pans because I knew I could cut the finished quiche into adorable, party-perfect triangles. I think finger foods and bite-size foods are the way to go when entertaining a bigger group than would fit around your dining room table for a sit-down meal. You want people to feel free to mingle, to pop a bite of something in their mouths here and there, to be able to hold a drink while munching, and to not feel overwhelmed trying to juggle plates and utensils. I made both types of quiche the same night, so I just sauteed one large onion to use for both, which you can also do, but I decided to write these as two separate recipes in case you just want to make one kind. I also wrote the recipes with the add-ins already prepared, so you can cook your bacon, onions, and spinach to your liking. I have to have crispy bacon. You can also get creative and use zucchini instead of spinach or add mushrooms. You can throw in some broccoli or use a different kind of cheese. It's totally up to you. I made the spinach quiche first, baked them, removed them from the pans, and then made the bacon and onion quiche right after. While my spinach quiche were baking, I prepared the filling and crust for my other quiche. As soon as my spinach quiche were cool enough to handle, I popped them out of the tart pans, and placed them on a cooling rack. I re-sprayed the tart pans and got right to work on preparing the bacon and onion quiche to bake. Preheat oven to 350. Spray four mini tart pans very well with baking spray, and place them on a sheet pan. Mix flour and salt together in medium bowl. Add butter, egg, and 3 tablespoons of water. Mix by hand or with a pastry blender until dough comes together. Add another tablespoon of water if needed. Divide dough into four pieces. Press each piece into bottom and up sides of mini tart pans. In a small bowl (or liquid measuring cup) whisk the eggs with the salt and pepper. Add enough cream to equal 1 1/2 cups of liquid. Sprinkle Gruyere in each mini tart pan. Top with spinach and onions. Carefully pour a little bit of egg filling into each tart pan, and let it settle among the spinach, onions, and cheese. Then go back and add more filling to each pan until custard reaches just below the top of the crust. Carefully transfer the sheet pan to the preheated oven. Bake for 15 to 20 minutes. To check for doneness, give the sheet pan a little shake and see if the egg has set. You can also press down on the egg to see if it is firm. The tops should be golden brown. Remove tart pans from sheet pan and place on cooling rack. These can be served hot or at room temperature. If serving hot, let quiche cool enough to handle, and then remove them from the tart pans. Cut each quiche in quarters and then cut each quarter in thirds for party-size triangles. The quiche can be refrigerated and then served at room temperature the next day. It can also be reheated in the oven or microwave. In a small bowl whisk the eggs, and combine them with the cream and salt and pepper. Sprinkle Gruyere in each mini tart pan. Top with onions and bacon. Carefully pour a little bit of egg filling into each tart pan, and let it settle among the bacon, onions, and cheese. Then go back and add more filling to each pan until custard reaches just below the top of the crust. So I had some trouble writing this post because I wasn't sure whether the plural of quiche is quiche or quiches. Looking online, I found both, but in my good old print version of the American Heritage Dictionary, just quiche is listed, so that's what I decided to go with. What do you usually say? That, right there, is the reason I made these cupcakes... and perhaps the way-past-their-prime bananas taking up residence on my counter. I don't know, I have a thing for monkeys. They're pretty cute, especially little ones. I guess I also have a thing for baked goods, especially ones with bananas and, um, peanut butter buttercream. Yeah, peanut butter buttercream. I could have just made that, plopped on the couch with the mixer bowl and a rubber spatula and been perfectly content. It's slightly salty and mostly sweet. Think about eating peanut butter right out of the jar but instead of being sticky and heavy, that peanut butter is light and fluffy, sort of cloudlike. Now pair that soft buttercream with banana cupcakes, spiked with cinnamon, and studded with mini chocolate chips. Any little monkey, including this one, would go nuts for that combination. The only monkey who wasn't interested was my boyfriend, until I offered to leave some cupcakes without bananas, chocolate chips, and frosting. He was excited over the prospect of plain-old cinnamon cupcakes. We definitely don't share the same tastes, but it was easy to play around with this recipe and create something we would both enjoy. Preheat the oven to 350 degrees. Line a standard 12-cup muffin tin with paper liners. In a medium bowl, whisk together the sugar and oil. Whisk in the egg, egg yolk, buttermilk, and vanilla. In another bowl, sift together the flour, baking soda, cinnamon, and salt. Using a whisk, mix the dry ingredients into the wet ingredients until just combined. Divide slightly more than half of the batter evenly among six muffin cups, filling them three-quarters full. Whisk the banana into the leftover batter and then stir in the chocolate chips. Divide the rest of the batter among the remaining six muffin cups. Bake, rotating the tin halfway through, until a cake tester (or toothpick) inserted in the center of a cupcake comes out clean, about 15 to 18 minutes. The cinnamon cupcakes may be done first, so remove them as soon as they are. Leave the banana cupcakes to bake about 2 minutes longer, or until cake tester comes out clean. Invert the cupcakes onto a wire rack, turn them top side up and let them cool completely. Meanwhile, make the buttercream: Fill a medium saucepan with 2 inches of water and bring it to a simmer. In the bowl of an electric mixer, whisk together the egg whites and sugar. Set the bowl on top of the saucepan, and whisking constantly, heat the egg mixture until it is warm to the touch, about 3 minutes. Transfer the bowl to the mixer fitted with the whisk attachment, and whisk on medium speed until the whites become translucent and shiny and form a soft peak, about 5 minutes more. Spread (or heap) the buttercream on top of the banana cupcakes (and the cinnamon ones too if you like). The cupcakes can be kept in an airtight container in the refrigerator for up to 3 days. This recipe creates some incredibly moist cupcakes. Even two days after I baked them, when my boyfriend was eating one of the cinnamon cupcakes, he noted that they hadn't dried out at all. This is incredibly important to me, considering I can't eat six cupcakes in one sitting. I had two per day for the next three days: one for breakfast and one for an after-work snack. They all tasted incredibly fresh. I stored the frosting-topped ones in the fridge and the cinnamon ones on the counter. I recommend taking the refrigerated ones out and letting them come to room temperature before eating them for the best flavor and texture. Someone asked me a while ago if I would recommend getting The Craft of Baking. At the time I said it wasn't necessary if she had a ton of other baking books, like I do. But the more I've been using this book, the more I've been realizing that it would be a great addition to any baker's library. I've really enjoyed everything I've made from it so far -- raised cinnamon-sugar doughnuts, simple sugar cookies, back-to-school raspberry granola bars, and vanilla bean ice cream -- and I've found the recipes to be straight-forward, well written, and easy to follow. 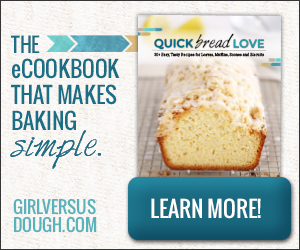 So I think I've changed my mind, and I think you all need this cookbook! Remember back in December when I made onion soup gratinee? I told you about a review copy of The New Book of Soups I had received. You didn't think I was just going to make one soup out of that whole book when we're having all this cold winter weather and there are so many fabulous soup recipes to choose from, did you? I had been craving lentil soup -- it's a weird craving, I know -- and I wanted a really good one. So I decided to make the whole thing from scratch using two recipes from The New Book of Soups. The onion soup was so tasty that I knew I couldn't go wrong. Plus, the picture of the lentil soup beside the recipe was exactly the type of lentil soup I wanted to make. One with plenty of broth, plenty of lentils, and plenty of veggies. I started out by making my own vegetable broth (kind of a baby step to making chicken broth), and then I used that homemade broth to make the soup... which means that this soup is completely vegetarian (I think). I don't usually cook vegetarian, and if I do, it's usually by accident, like it was here. I'm pretty sure the only reason I refrained from crumbling some bacon on top or adding some sausage is that this soup came out so incredibly delicious as is. Heat the olive oil in a soup pot over medium heat. Add the garlic and shallots and cook, stirring frequently, until they are translucent, 3 to 4 minutes. Add the remaining ingredients and bring slowly to a simmer.Cook until the broth has a good flavor, about 1 hour. Strain the broth through a sieve and then allow it to cool completely before storing in the refrigerator. Heat the oil in a soup pot over medium heat. Add the onion and garlic. Cook, stirring occasionally, until the onion is translucent, 4 to 6 minutes. Add the carrots, leek, and celery. Cook, stirring occasionally, until softened, 5 to 7 minutes. Add the tomato paste, stir well, and cook for 2 more minutes. Add the remaining ingredients and bring to a simmer over medium-low heat. Cook until the lentils are tender, about 40 minutes. Remove and discard the sachet and lemon half. Puree the soup if desired (the lentils may have already turned into a puree by this time). Adjust the seasoning to taste with salt and pepper. Serve in heated bowls, garnished with the croutons. This tasty soup was slightly sweet from the wine and sherry wine vinegar, richly flavored from the homemade broth, and nicely textured from the lentils and veggies. It's both warming and filling. It was exactly the sort of lentil soup I had been inventing in my head when my craving first started. I followed the recipes above with the following exceptions: For some reason I couldn't find fennel at Whole Foods, so I didn't have that for the broth. But the parsnip adds a similar flavor, so I don't think it was a huge loss flavor-wise. I also used pepper instead of peppercorns and left out the juniper berries when making the broth. I skipped the caraway seeds in the cheesecloth pouch because I didn't want that flavoring in the soup (it's okay in rye bread though), and instead of croutons, I topped each serving with grated Parmesan cheese. The results were phenomenal. If you're a fan of lentils, I highly recommend this hearty soup. Have you been making any soup this winter? What kinds? This post is as much about the recipe and the cookbook it came from as it is about the meal we enjoyed. Some sort of red meat like lamb, filet mignon, or osso buco seems to embody Valentine's Day. Is it the red color, the glamour of it? I don't know, but I'm always drawn to making meat for this romantic occasion. But not this year. This year I made a recipe I have been eyeing since my old roommate first gave me The Zuni Cafe Cookbook two Christmases ago. Triumphant in her quest to find me a cookbook I didn't already have -- not an easy feat -- my old roommate also succeeded in finding one I instantly fell in love with. The Zuni Cafe Cookbook, which contains recipes from Judy Rodgers' and Gilbert Pilgram's Zuni Cafe in San Francisco is beautifully written by Judy Rodgers. Rodgers' writing is such that it almost makes you look up, quizzically, to see if she's there in the room with you. It's shocking to find that she isn't but rather that you've just gotten so absorbed in her words and stories. This cookbook is one that you take to bed with you, leaning over the pages, propping your head on your wrist so long that the ache in your arm finally tears you away. But that won't keep you from doing the same thing the next night and the next night. The Zuni Cafe Cookbook can be read and reread, new information gleaned with each reading. From the moment I found it in my possession, I read it from cover to cover. Over time, my initial curiosity sated, I've flipped through it again and again, focusing on a recipe for fried figs one day; one for mixed lettuces with roasted cherries, hazelnuts, and warm Saint-Marcellin another day; or one for espresso granita yet another day. The one recipe I've pored over the most, flipping back and forth between its instructions and its mouthwatering photograph is the Zuni Roast Chicken with Bread Salad recipe. Once I decided I was actually going to attempt to make the roast chicken and bread salad, I read and read and reread so much that you'd think I would have worn away the ink on those pages. I followed prompts to check out the sections on roasting and on salting early. I wanted to make the most perfect roast chicken I could, so I let Rodgers hold my hand through each paragraph. I studied intently each step. I weighed out the differences in the various salts she explained. Before reading this book, I hadn't even thought about how my use of kosher salt might compare with the use of medium grade fine sea salt (which Rodgers uses). I could have severely undersalted my chicken if I hadn't spent time checking each step and each nuance of each step. I can't say it enough: read, read, and reread. It's easier to execute a recipe well when you're completely prepared to tackle it. The Zuni Cafe Cookbook is not for those who look to Rachael Ray for advice on 30-minute meals (which is totally fine); it's for those who want to get into the kitchen and spend all of their time there. It's for those who truly love cookbooks, who enjoy the stories and hints rampant through their pages. It's for those who crack a small smile when Rodgers says to stop and taste what you're making. It's for those who already taste every step along the way. It's for those who are like me. I wish I could write the way she does, a way that makes you stop and think as you're reading about making something, a way that makes you stop and think when you're in the midst making something. If you're someone who can stay focused and follow a recipe verbatim, you can't go wrong with a recipe from this book. Rodgers even tells you how to correct something if it seems like it's going wrong. But I'll stop fawning over and professing my love for this cookbook and tell you about the roast chicken and bread salad. Does bread salad entice you? Maybe... maybe not? Just the word bread draws me in... and when I find that the bread is dressed with chicken drippings, well then I'm just done for. I think the main reason I wanted to make this dish was not for the chicken (though it is a famous dish I recommend everyone try at some point) but for the bread salad, with its chicken drippings, plump currants, toasted pine nuts, and sauteed garlic and scallions. This recipe is close to four pages long. There's no way I could recreate it here... nor would I want to. I think part of why this recipe works so well is the way it is written. There's a pared down version on Smitten Kitchen if you just really want to know how to make it, but I recommend at least grabbing a copy of the cookbook from the library if not just purchasing it. Any offshoot of this recipe is just not going to cut it. I wouldn't have achieved the same results or felt quite so inspired had I not followed Rodgers' recipe word for word, detail for detail... or almost. I used the whole loaf of bread in my excitement, when I really should have just used half. Ah well -- what's a little more bread? There are worse mistakes. Here's the dish... in pictures. I ended up enjoying the chicken as much as the bread salad. I always have trouble cooking chicken, but this time, I managed to roast it perfectly -- the skin was crispy and golden and the meat was incredibly moist. I owe that to Rodgers' explicit instructions. At first, my boyfriend looked hesitantly at the bread and, carefully treading on my feelings, told me not to be upset if he didn't like it because he doesn't like soggy bread. Well, I don't like soggy bread either, and I knew this bread wouldn't be soggy. It would be moist from steam and drippings, but soggy would not be a word to describe it... and we both loved it. Though I might even toss the bread back under the broiler for a couple minutes after adding the drippings in next time... for a little extra crunch. I even took pieces of the bread and wiped more drippings out of the pan I roasted the chicken in. That might sound gross, sopping up fat and grease, but it was far from disgusting. The drippings packed so much flavor. Uncharacteristically, my favorite part of the chicken was the small wing -- because it had the crunchiest skin, packed with the most juices. This whole meal was just unbelievable, and if you have a few hours, you really must make it. I never realized something as simple as chicken and bread could be so incredible. So it wasn't a juicy red hunk of meat, but, really, what's more romantic than splitting a chicken?